To create a unique, inspiring atmosphere in Delphi where judges from 11 countries evaluated 359 olive oils for the Athena International Olive Oil Competition, competition chairman Constantine Stergides hired architect Elena Stavropoulou to make a striking art installation. Her installation memorialized the Greek olive oil production tradition of the past. Last month in Athens, the Olive Challenge Demo Day unveiled fifteen cutting edge creations in a unique Greek olive oil and olive sector contest focused on innovation. Top honors went to the Olive Predictor, a miniature olive mill and tester that let olive oil producers determine the healthy phenolic content and oil yield of their olives before the harvest. Many Greek olive oil companies welcome schoolchildren to their mills, bottling plants, and tasting rooms to learn about olive oil production, export, history, taste, uses, and health benefits. Last year, Terra Creta went farther, hiring a teacher to develop a specialized experiential learning program for kindergarten and elementary school students in Crete. 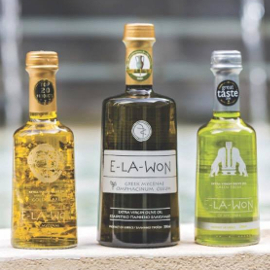 Greek innovations in the olive oil realm range from an updating of ancient methods and arts to groundbreaking new science, from educational outreach to environmentalist philanthropy. In Crete, researchers at the Mediterranean Agronomic Institute of Chania are working on a new method to identify olive varieties that should lead to contributions to an international database and a new cell phone app. At a more basic level, Biolea crushes whole bitter oranges and lemons under stone mill wheels with organic olives to make artisanal cold pressed olive oil with amazing citrus flavors. The Association of Cretan Olive Municipalities reaches out to children and their parents with free children’s books and theatrical projects that teach about the health benefits and tasty appeal of olive oil. 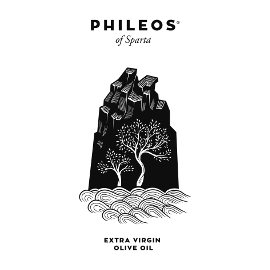 In Athens, potters handcraft updated versions of ancient vessels to hold Ladolea’s extra virgin olive oil. 2yolk graphic designers inspired by ancient goddess statues created the design for Great Stories’ 39/42 olive oil containers. For every bottle of olive oil evo3 sells, money is donated to the Eden Reforestation NGO to plant a tree in a deforested area. During the past two years, trees on public land in the Athens suburb of Glyfada were harvested by volunteers to make free olive oil for the needy. At the University of Athens, Dr. Prokopios Magiatis and Dr. Eleni Melliou invented a miniature hand-held “laboratory” to test the amount of certain healthy phenolic compounds in olive oil. Greece may have seen better days, but its citizens’ bright ideas and persistent labor continue to offer striking surprises that suggest there’s hope for its future. Click on the links for details. Biolea’s whole organic lemons stone milled with their organic Koroneiki olives. 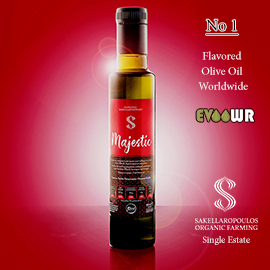 Invented by Dr. Prokopios Magiatis and Dr. Eleni Melliou at the Kapodistrian University of Athens, the Aristoleo™ test kit measures the amount of oleocanthal and oleacein in olive oil quickly and inexpensively. Biolea’s whole bitter oranges stone milled with their Koroneiki olives.